Ultrasound is a safe procedure that uses reflected sound waves instead of radiation. The images are obtained with a small ultrasound probe passed over the patient that both sends and receives sound waves. The waves passing through the body are reflected back and computer processed to generate an image. 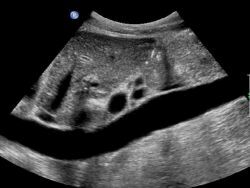 Ultrasound is commonly used to image pregnancy, the abdomen, and pelvis. Special measurements of blood flow can also be obtained to evaluate narrowing of neck (carotid) or leg artereis and veins. Ultrasound is also used to guide needle for biopsies including breast biopsies and for directing placement of catheters (small tubes) into blood vessels. All of WRS radiologists are doctors with dedicated training in ultrasound.